Her epiphany came on Christmas morning. Debra Hazlett sat with her husband, Thomas, in a hospital room, as he recovered from a kidney obstruction. “It was a difficult time because it was the season of the swine flu scare, so my children were not allowed in the hospital,” Hazlett said. Hazlett’s husband recovered, and the holidays turned into a new year with Hazlett beginning her educational journey at Tidewater Community College the following spring in 2010. On Friday, she will graduate with an Associate of Applied Science in Nursing. 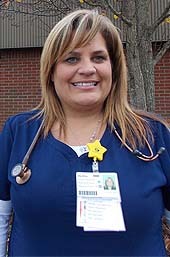 Having already passed her boards, she has begun working in the medicine/telemetry unit at Sentara Leigh Hospital. TCC’s program came highly recommended. “My personal nurse practitioner recommended TCC’s nursing program; she said that TCC nurses are well prepared when they enter the workforce,” she said. Despite age differences with fellow classmates, Hazlett made lifelong friends. “The students in my cohort became like family. We studied together and supported each other,” she said. TCC became a family affair, with Thomas studying computer aided drafting and design and daughter Kayla entering the nursing program next summer.